I was recently asked about Lacona Streets and who they were named after. This column will cover that. Many streets bear the names of local builders. This column will feature Powers Avenue, DeMott Avenue and Tifft Street, all in the Village of Lacona as researched by Mrs. Gilbert Williams for the Wednesday Club in 1959. Powers Avenue was named after the Powers brothers. Albert Powers’ family for many years resided on Railroad Street and later he built a home on Powers Avenue where he resided until his death in 1900. Albert also engaged in the hardware business and owned the north end of the block, west of the hotel and was engaged in business there. Albert was the first collector elected in the village of Lacona in 1880 upon the incorporation of the village of Lacona. His brother, Parley Powers, was long owner of the Lacona Milling property. Another brother, Jacob Powers, later had a dry goods store in this same location. DeMott Avenue: J. S. DeMott, for many years one of the most prominent citizens of Oswego County, spent the greater part of his life as a lumberman. He lumbered extensively in eastern Oswego County and the Adirondacks. These operations led him eventually to establish a home at Lacona where he speedily became a factor in community affairs. Through his efforts the Lacona water system was installed and he remodeled and built several fine residences in Lacona and two on Railroad Street in Sandy Creek. Through his efforts the Binghamton colony was established on Ontario Bay and he was one of the pioneers in the development of this resort. 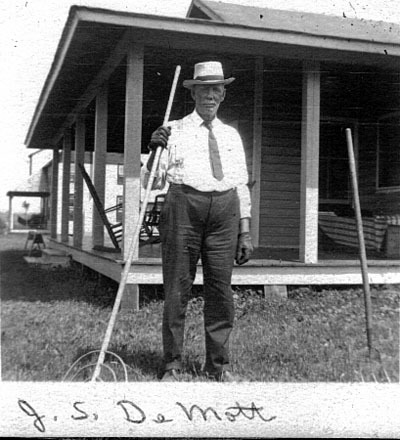 Mr. DeMott died in 1921. The house which he owned on the street which now bears his name was occupied by Leon Stowell and was formerly owned by E. M. Hastings who purchased the property and lot in February of 1909, and later built the office building formerly occupied by the Blount Lumber Company. Tifft Street was named after William Tifft, one of Lacona’s leading citizens. He was the first local station agent of the R. W. & O. Railroad and this position in those early days offered many opportunities for the purchase and sales of farm produce. He became one of the most extensive dealers in these commodities in this area. He erected the Tifft block and laid out Lacona into village lots and much of Lacona’s early prosperity was due to his genius. He was a member of the first board of education of Sandy Creek Schools and served on this board for over 10 years. Mr. Tifft died in 1912.